INTERGALACTICA was a show curated by Tribe Magazine, the region’s only publication devoted solely to photography from the Arab world. The exhibition comprised works by “Instagram artists”, whose images were printed for the first time at Abu Dhabi Art. This painting by Nabil Anani (b. 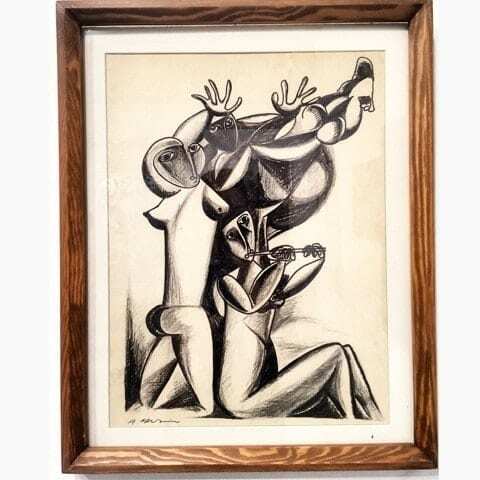 1943) was presented by Ramallah based Zawyeh Gallery. The muted colour scheme and soft expressions of the characters in End of Innocence (2016), evoke a sense of tenderness, which is emphasised by the long limbs that the women use to shield their children. 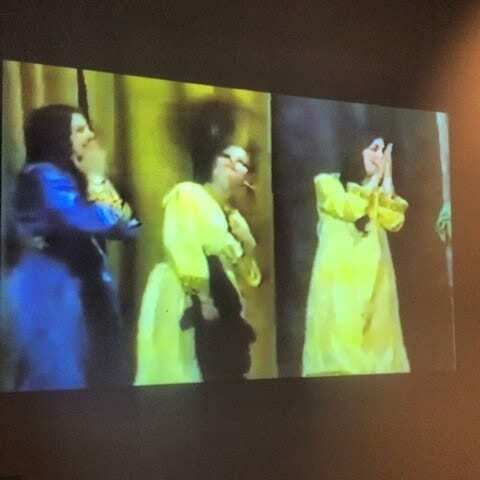 The colour and energy in Hind Mezaina’s film Dancing Girls was striking. 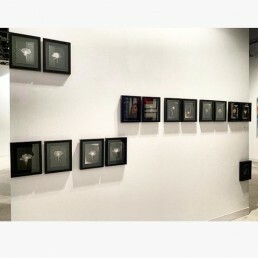 The short film was exhibited as part of LETTERS, which was inspired by Omar Saif Ghobash’s book A Letter to a Young Muslim, and curated by Athr Gallery. LETTERS was divided into a number of themes that included: Fragments of Memory, Youth and Other, Probable Questions and The Grey Area. Reem Falaknaz’s (1985) Harish and Bharti was shown in the Fragments of Memory section of LETTERS. The date of the original photograph (9.4.1983) is displayed next to the image, but we know very little about the figures in the photograph. 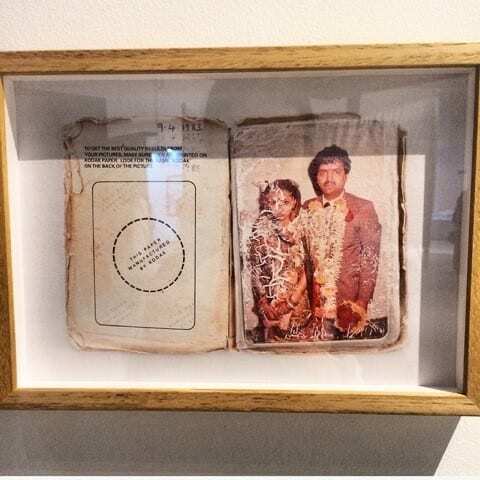 The ageing object prompts the viewer to ask who couple is, and where they might be now, more than 30 years later. This series, View Master (2014), also part of LETTERS, is by Ahmed Mater (b. 1979). 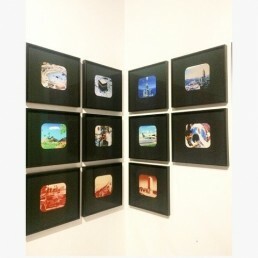 Across the analogue images are recognisable Saudi landmarks including buildings and Mekkah. The photographs take us back to a time that many of the viewers might not remember, taking the viewer back to a time that might be described in a letter. 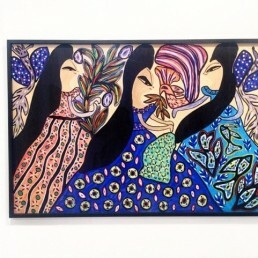 Mai Almoataz’s Stop + smell the roses was exhibited by Hafez Gallery. Almoataz’s series alludes to themes of femininity, veiling, catharsis and introspection. Her consistent aesthetic of a black print in a black box is an extension of the idea of the girl who is lost in the dark, but she is not lost when she is in her darkroom, and the way the roses seem to glow emphasise that the light is always there, even in the dark. 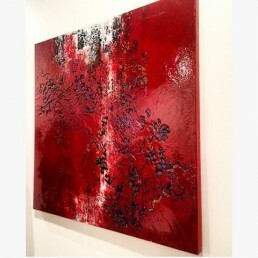 This highly textured resin and acrylic painting by Sara Alagroobi (1989) was presented by London’s Park Gallery. A cackle at the Union Jack is an artistic response to the decolonisation of western institutions and the perpetual social white-washing of Arab culture and identity. The childlike facial expressions and vibrant colour scheme in this painting by Algerian artist Baya (1931 – 1998), caught all the viewers’ attention at the Tunisia and Dubai-based gallery El Marsa booth. 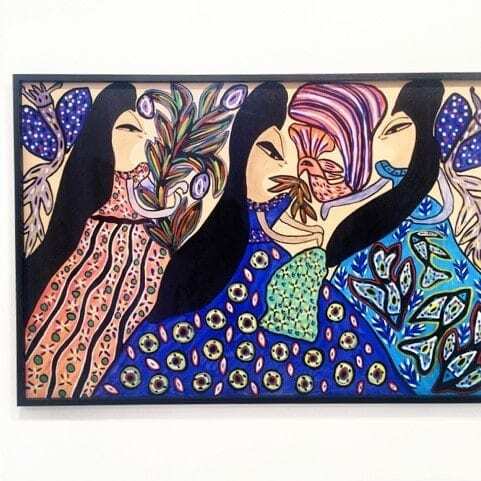 Critics have likened her work to surrealism, primitivism, modernism and naivety, but Baya never chose to self-identify with any particular genre. 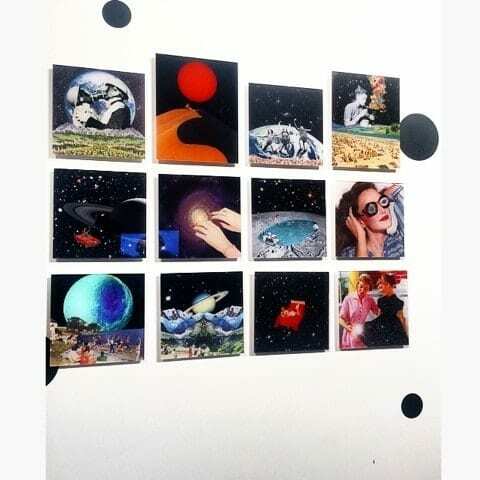 Within the fair, was a special exhibition called ICONS OF MODERN ART. 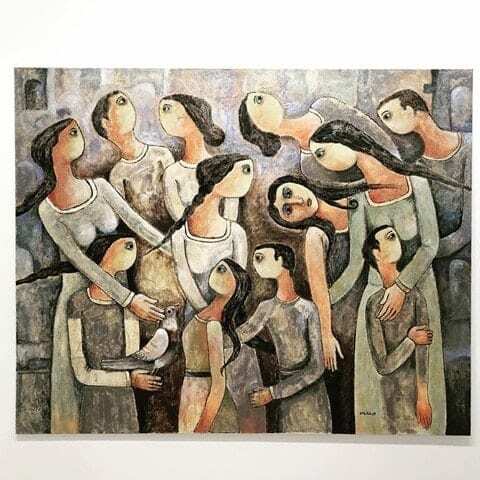 Curated by Omar Kholeif, some of the most important modern Arab artists were presented as having reached “icon” status across several galleries. 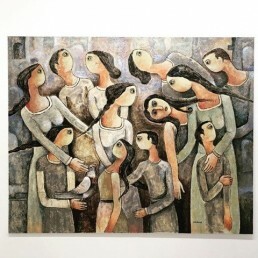 Lawrie Shabibi exhibited both sculpture and paintings by Mona Saudi (b. 1945), who was also present at the fair. 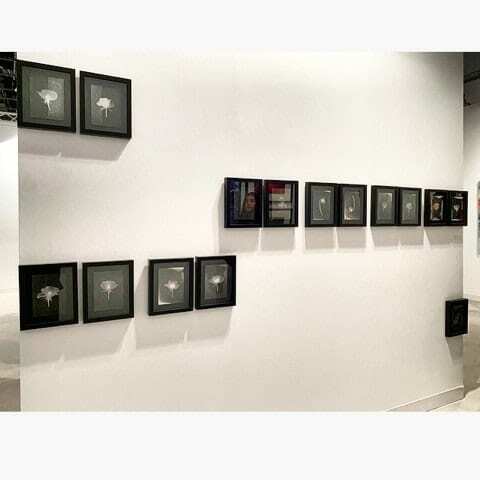 Her work is heavily influenced by poetry — particularly Adonis and Mahmoud Darwish — as well as the surface and physical qualities of the stones from which she carves. Egyptian artist Ahmed Morsi (b. 1930) was also included in ICONS OF MODERN ART. 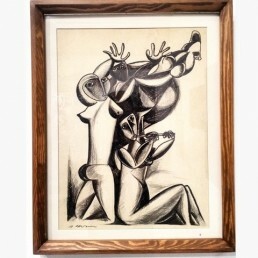 This pen on paper work, exhibited by Cairo’s Gypsum Gallery, is particularly expressive, and Morsi is considered to be one of the most important modern Egyptian artists.